Bob Cook, our founder, was raised on a farm and in 1958 purchased a Massey Ferguson dealership, which operated under the name Henry County Supply. When his son’s were old enough, he began farming again, and continued until the late 1980’s. As his children grew, he included them in the business and expanded into row crop farming, fertilizer and chemical sales. He also built and ran a grain elevator. After 30 years of steady growth it became necessary for more room. In 1988 the business moved to a location outside of Clinton, MO to concentrate on the used parts business. In 1991, the business moved to Germantown, IL to expand the Cook Tractor business. Since then we have grown into a large used parts dealer in the Midwest, working with clients all over the country. 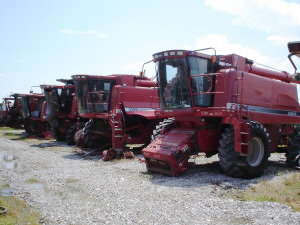 Collectively we have 50 plus years of experience in the tractor and combine salvage industry. Our current location sits on 13.5 acres filled with a robust variety of tractor and combine parts. Our small business expansion has been growing every year since 1991 and has grown into a large tractor and combine salvage yard. We have two large warehouses filled with good used/rebuilt/and aftermarket parts inventoried and hand inspected.